In Winter Park Colorado, snow is plentiful. We are blessed with over 300 inches a year but Mother Nature isn’t always on our schedule. These days the whispers of climate change are playing out in the historical almanacs around the globe. Much of a ski resort’s early season and late season success depends on a crew that doesn’t get much recognition, a crew of 41 people, managing a system of high pressure air and water to create 24 karat white gold. 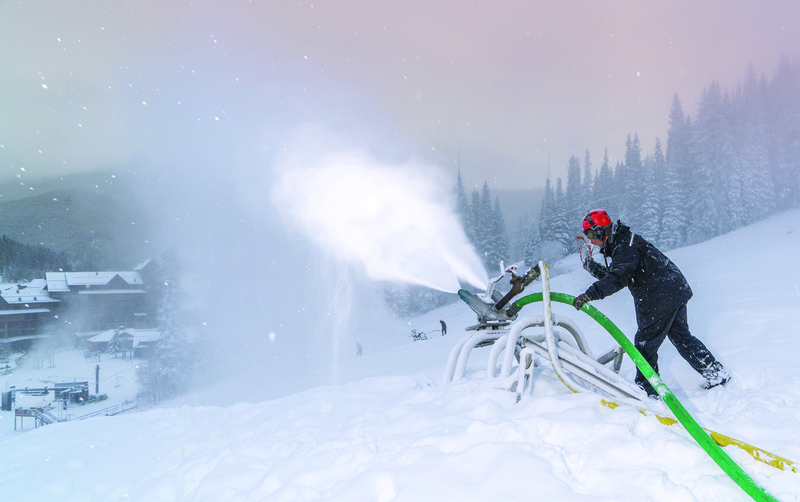 The unsung heros of the slopes are the snowmakers at Winter Park Resort. A dedicated crew that cover 12 hour shifts to keep an aging system running three months out of the year. A crew constantly hard at work, whether they are prepping for the next cold spell or hiking the trails in the middle of the night adjusting the guns. 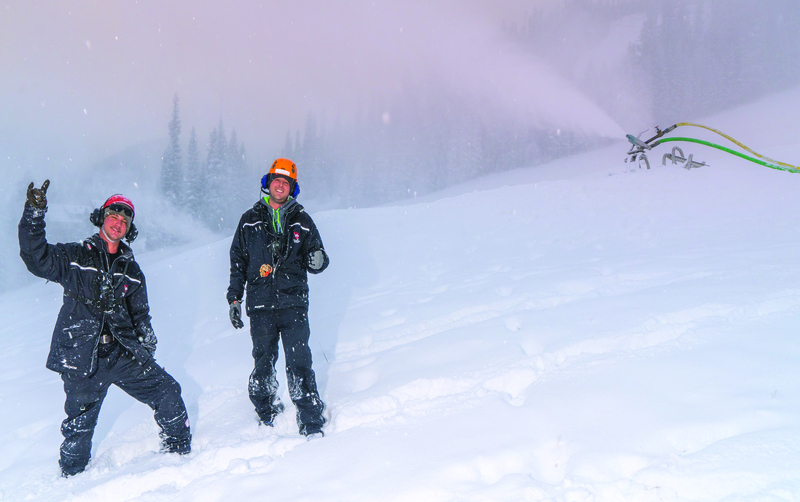 Snowmaking is a tough job anywhere, but the team at Winter Park Resort has proven year after year that they have the tenacity, passion and expertise to be some of the best in the business. The optimal temperature for snowmaking is 28 degrees fahrenheit and below. According to Steve Hurlbert, PR Director for Winter Park Resort. “When the temperatures are right the crews work 24/7 to maximize the system’s output.” The snowmaking crew starts early October and usually wraps up by the end of December, however, this year has been a rollercoaster of record high temps that put the crew behind schedule. If mother nature doesn’t cooperate in the next couple of weeks, they will likely blow well into January. 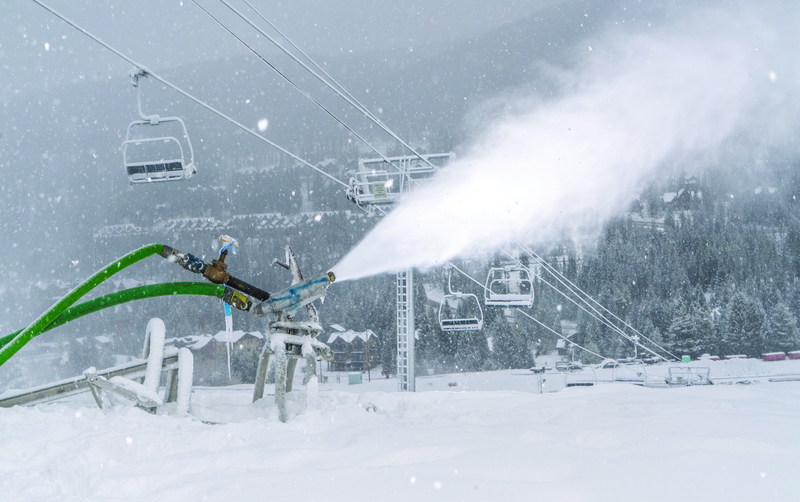 Snowmaking, in principle, is relatively simple. Water is pulled from a source, pumped onto the mountain, and forced through a nozzle by pressurized air. From there, the water droplets freeze into snow crystals and settle to the ground. On a good day the Winter Park crew will run close to two million gallons of water through the system. When the system is fully pressurized it can handle about 30 guns effectively. Snow guns and snow blowers come in a variety of styles and sizes. The resort has 60 guns that must be hooked up to the high pressure system and an additional 16 airless/fan guns designed for maximum output and efficiency. The newer guns work independently of the older system. Winter Park Resort utilizes around 80 million gallons of water each year depending on the season. Today’s system can cover about 300 acres of trail but the crew also uses the snowmaking system to fill in gaps on trails, summer roads, ditches, bike park obstacles and build really cool terrain park features. Winter Park Recreational Association invested in the first system and pump station in 1976. Jerry Groswald, former President of Winter Park Resort, use to say jokingly, “infinite wisdom not dumb luck” was their reason for investing in a snowmaking system. The first system covered the lower Winter Park mountain only. The same year the first system came online, the resort reported the least amount of snow on record (since opening day 1940). To put it in perspective the Mary Jane opened that year on January 23rd and closed about 5 weeks later. The Winter Park snowmaking system has undergone several upgrades and extensions over the years and has served the resort well. This year the resort invested in 4,600 feet of new pipe mostly as replacements in the system. Dave Hagerman one of the system experts said, “The system is over 40 years old so there is a lot of maintenance that goes into keeping it running each season.” There are a handful of crew members that know every inch of the system and can maximize the efficiency and output each night ensuring a mid-November opening date. 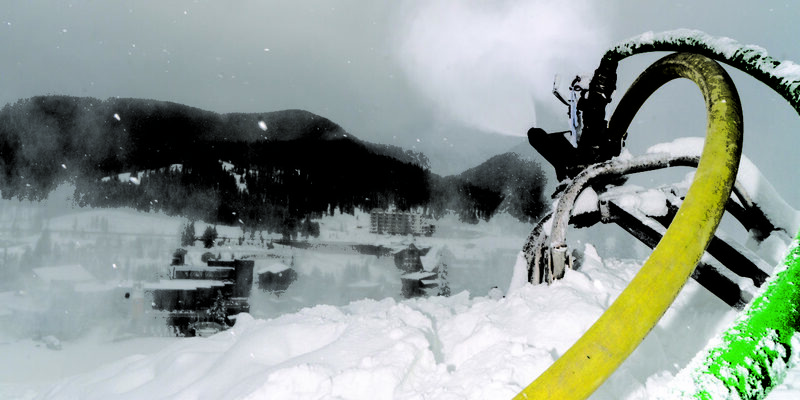 Snowmaking is is a combination of science, engineering and art. It takes constant monitoring and care to create the perfect crystals that blanket the winter wonderland we enjoy. As we look toward the future, the resort plans to continue investing in their snowmaking system while making each part of the snowmaking chain more efficient and more powerful. This means more snow guns, new technologies, and some big steps forward to maximize efficiency and water usage. So while Mother Nature may not be on track to fulfill her early season quota this year, the Snowmakers are going to at least answer some of our prayers for a snowy white Christmas and beyond! Got a snow dance to share, voodoo magic, crazy myth, whatever? Get your groove on and post to any facebook you can….our social media guru lives to share someone else’s awkward beliefs and behaviors. Let’s go viral Winter Park!